[Source: cinemablend.com] More than 30 years will have passed since the events of Return of the Jedi and those of Star Wars: The Force Awakens. Given the dramatic nature of the end of Jedi, there are some big questions that need to be answered, and now we have our first details about how Lucasfilm, Disney, and company plan to fill this gap. "Emperor Palpatine’s twenty-year reign of terror came to an abrupt and fiery end in the skies above the forest moon of Endor. A decisive victory for the Rebel Alliance, to be sure, but even with the loss of its leadership, the Empire’s Moffs and regional governors retained their hold on important systems from the Core to the Outer Rim, thanks to the might of the Imperial Starfleet. Now, with a power vacuum atop the Empire, those Moffs will jockey for position and control, and the heroes of the Rebel Alliance will soon discover that a wounded and fractious Empire may be more dangerous than any threat they faced before!" That sounds like a damn fine time to us. Comic industry vet Greg Rucka (Batman, Superman, Wonder Woman, Daredevil, Spider-Man, and countless others) is collaborating with Marco Chechetto (Punisher). As you can tell, the story will get into the specifics of what happens after the Rebel victory at the Battle of Endor. Shattered Empire should clarify much, or at least large chunks of what we’ve seen thus far in the two quick The Force Awakens trailers. While the destruction of the second Death Star is a huge blow to the Empire, it’s such a big, expansive operation that even killing two of its main leaders and blowing up its biggest weapon is not nearly enough to completely topple what they’ve established. A lot of people have speculated that in the aftermath of the death of both Emperor Palpatine and Darth Vader, there would be a mad scramble amongst their underlings to seize power, and that certainly seems to be the case. This synopsis doesn’t go into specifics, but in this chaos, it appears that instead of one unified Empire, there are many warring groups. We know that the villains in The Force Awakens are called The First Order, they’re the ones with the new-look stormtroopers, and while we don’t know for sure, it is looking like they are perhaps the biggest, or at least one of the biggest offshoots to grow out of the rubble of the Empire. And if they rise to the top, you know they must be all kinds of ruthless. A four-issue miniseries, the first installment of Star Wars: Shattered Empire hits comic book stores on September 2. 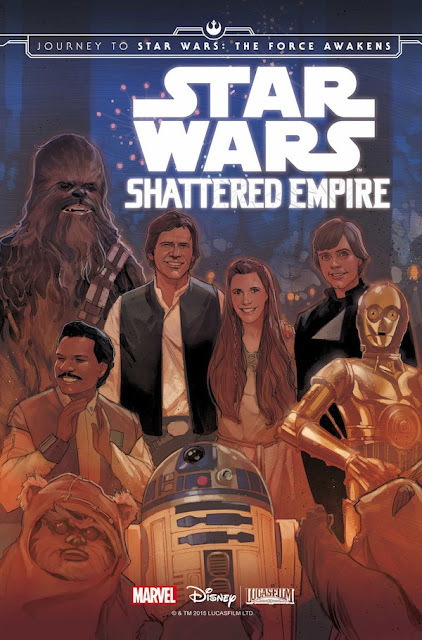 A trade paperback collecting all four chapters will follow on November 17, giving you more than enough time to catch up before Star Wars: The Force Awakens arrives on December 18.